A house can be any family’s largest asset, especially for those who are poor and vulnerable. The loss of a house leaves people who are already living on the edge exposed to ill health, poor security, indignity and poverty. Secure shelter is a catalyst for enabling families to recover from emergencies. Shelter provides security and dignity through privacy. Shelter protects health and supports access to water and sanitation services. After a disaster, we remain with communities to help them rebuild their homes long after the TV cameras have gone. We help families prepare for and minimise the impact of emergencies through transitional shelters, supporting their return home and improving the construction of their houses and community buildings. Our projects range from improved construction to security of land rights, from infrastructure repair to supporting home-based businesses. 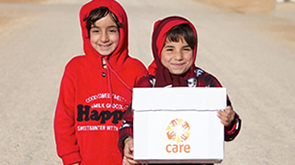 CARE’s Shelter programme is both innovative and exemplary in its approach to ensuring quality and accountability. We help communities prepare for emergencies, through capacity building, training, and advocacy for housing, land and property rights. When disaster strikes, we deploy shelter experts immediately to support emergency response on the ground. Their expertise ranges from architectural and structural engineering design support, to development of communications materials and training programmes to enable communities gain the skills to build back safer. And after a crisis, we support evaluations and reviews to ensure lessons are learnt, both for the affected communities and for other emergency responses in the future.